When Shaina finds a beautiful hen, her mother and grandfather want to have the hen for dinner. Times are hard, jobs are scarce, and everyone is hungry. 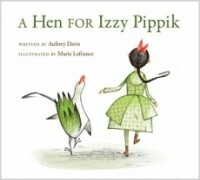 But Shaina knows the hen belongs to Izzy Pippik, and she refuses to allow anyone to eat Izzy's hen. She also refuses to let anyone eat Izzy's hen's eggs. Soon, her house is overrun with chickens, and her mother tosses every last hen out into the town square. The townspeople want to eat all the hens as well, but Shaina stands up to them, and they all agree to let Izzy's property be. Before long, the entire town square is full of chickens, and tourists begin to show up to see the town full of chickens. Tourists bring money, and it turns out that in doing the right thing, the entire town is blessed. I loved the book. 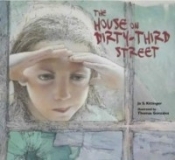 It's a sweet, fun story with an excellent message about speaking out against injustice. It shows that even a child's voice can make a difference. The illustrations are colorful and lovely as well. Highly recommend.